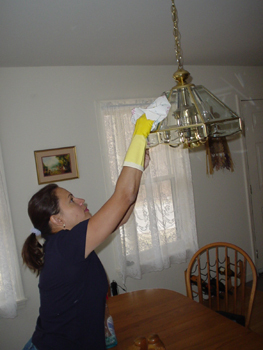 - Are you looking for someone that will clean your home with care and love and attention? That will clean your home like it's your own? - Are you looking for someone absolutely reliable, trustworthy, professional and that will always bring a bright smile to your day? - Are you looking for a House Cleaning professional that will get your place spotless without charging you a fortune? Look no further. I promise to clean your place like you never seen before. Cleaning houses since 1999 gave me the experience to provide an excellent cleaning service to my list of dozens and dozens of current clients (which I consider primarily friends). I have clients that are with me since the first year. If you decide to choose my services, I can put you and contact with them so you can hear a little bit more about the quality of the work and professionalism I present to each and every cleaning. I've been cleaning since 1999. Cleaning is my expertise. Will clean with excellence. Will leave your place spotless. With your place always clean, it will reflect in your personality and you will become much more productive. Excellent communication skills. If you become my customer, besides communicating over the phone, we will also be able to communicate using email. Send me your special requests over the email and I will take care of it. I will not provide you with excellent references, I will provide you with evangelists of my cleaning services. People who love my services. Please only hire my services after talking to my current clients. You name a town around the Atlanta Area and probably I will find client to talk to you about the quality of my cleaning services. "I just wanted to drop a note on how wonderful your services are and how you have made my life easier! With the crazy schedules I never have time to have my home clean yet with your help my home is always clean! Thanks for all you help"
Thanks again so much for the awesome job you did on Tuesday! I cannot tell you how much of a relief it is to have the house in such spotless condition! I can't wait until next month! You do a fabulous job!" Question 1 - Is the person/company reliable? Can I count on them? Solange: Sure, you can count on me. We value reliability. You can always count on us. Question 2 - Can I trust them with my keys and alarm code and go to work? Solange: No question about it. We have dozens of customers who trust their keys and alarm code to us. Question 3 - Will the cleaning service fit my monthly budget? Our prices are very affordable. We do **NOT** charge the high prices of the big cleaning chains. 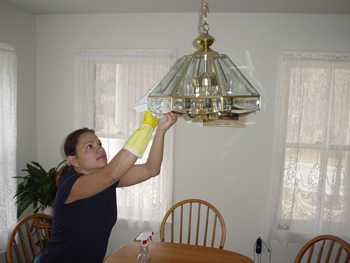 "We care about our cleaning service to you, and we're not satisfied if you're not. First, we discuss your wants and needs, to make sure we won't miss anything. Mopping floors since 1999, I know the tricks of the trade. Believe me, a house cleaner "must" know the intricacies of cleaning floors. 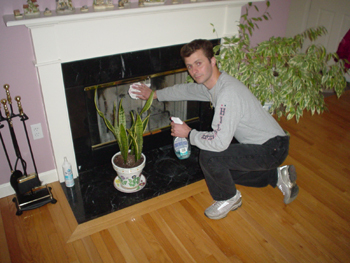 Did you know that you are "not" supposed to use Pine-Sol in your hardwood floors? Read more here. Your counter tops should be thoroughly disinfected regularly. Please let me help you with that. I will be so careful with your house. I know the emotional feeling your have for your belongings. They are not "things". They have a history in your life, and I respect that. I'll remove dust from each and every item. 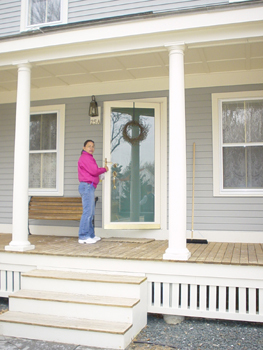 A dust-free house has less propensity to allergies and indoor pollution. I don't like to bash other house cleaners that I've worked with in the past. Although, in general, they treat the ornaments carelessly. I am the opposite. A client of mine once told me: "I've got this item from my grand grand grand mother". Could you imagine that? How much does that cost? Priceless. 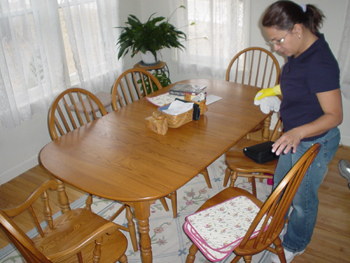 When your table is cleaned, it's cleaned thoroughly. Every item will be removed from your table. And it will be cleaned. And you can trust the surface is completely cleaned. Chandeliers accumulate a lot of dust. They will be dust-free and ready to show its beauty whenever you give us a chance to clean your home. From time to time my husband will help me to clean your place. He's so enthusiastic about cleaning. He's also so detail oriented. 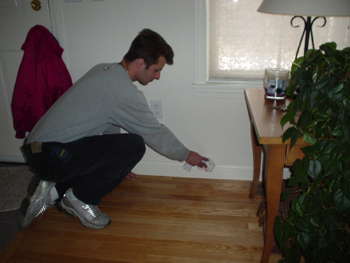 Your baseboards will be so well cleaned that your will house look "brand new" again. Let us make your house your base to regain energy to face the challenges of life. Nothing feels better than a deeply cleaned home. Not all house cleaners can take care of mirrors the way we do. There are special ways to treat a mirror in order to achieve total cleanness, streak-free look. One clue: proper cleaning material + a special technique done by your hands. You can rest assured you can leave your keys and alarm code with us. When you come back home, you will find a home that you will feel great in it. We have dozens and dozens of references that you can talk to. We are authorized to live and work in the US. And last, but not least, cleaning is what we do best. When selecting a house cleaner in the Greater Atlanta Area, pick one that you can trust. 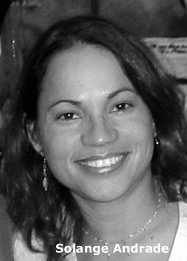 Gil and Solange Andrade have proved to be the most reliable and effective Cleaning Company. They are professional and efficient to work with and very well-Organized. The contribution to all areas of our company has been much appreciated. I believe that Gil and Solange will make a valuable addition to any organization that needs the best cleaning service. We deeply recommend their Company without hesitation.